The Cordillera del Cóndor mountain range sits on the border between Ecuador and Peru. 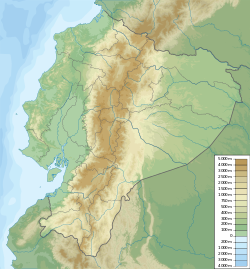 The Cordillera del Cóndor (Condor mountain range) is a mountain range in the eastern Andes that is shared by and part of the international border between Ecuador and Peru. Ornate Antwren (Epinecrophylla ornata) from the mountain range, which has a rich population of bird life. The range extends approximately 150 km north to south and its maximum elevation reaches approximately 2,900m. The Río Santiago and Cenepa River flow along its eastern slopes on the Peruvian side. For over 160 years, the area of the border was in dispute, and sparked armed conflicts between the two countries in 1941, 1981 and 1995. After the border conflict of 1995, the two countries began diplomatic negotiations, resulting in the 1998 peace treaty that established the exact location of the international border. The Cordillera del Condor is an area of great interest to biology, possibly having the richest flora in any area of the same size on the South American continent, and is considered by Conservation International to be one of the most important biodiversity areas on the planet. The cordillera has one of the highest concentrations of vascular plant species yet unknown to science. The area is part of the ecoregion of the Eastern Cordillera Real montane forests. In 1993, Alwyn Howard Gentry and his colleagues, in a trip organized by Conservation International and helicopter support provided by the Ecuadorian Army, were able to collect bromeliads from the prairies for the first time. Robin Foster and Hamilton Beltrán conducted botanical inventories in 1995 on the Peruvian side of the border, on a second trip sponsored by Conservation International. Numerous collections of orchids from the region were made by Alexander Hirtz and Carlyle Luer. Following the armed conflict in January 1995, exploration of the biological region became impossible. José Eduardo Manzanares and Cave were perhaps the first botanists to visit the area after the signing the Peace Treaty of 1998, with a short visit in May 1998 to collect Bromeliaceae. With the support of the National Geographic Society, the Missouri Botanical Garden and the National Herbarium of Ecuador, in December 2000 a series of expeditions were launched to make inventories of the flora in the Ecuadorian slopes of the cordillera, visiting places that no biologist had set foot in before, such as the Ijiach Naint hill in the Coangos River Basin. These recent field trips, carried out with the collaboration of the Shuar Federation, yielded a number of plants new to science, not seen in previous trips to other locations in the Cordillera del Condor. This page was last edited on 18 June 2017, at 20:49 (UTC).